"Is It Really Possible To Fast-Track All The Years Of Learning And Shoot Beautiful Seascape Photographs On Your Very Next Shoot? Because if you're the kind of person who loves seeing your images shine and grab everyones attention whenever you share them but you're just not sure how to take your photos to that next level, then pay close attention – because this is for you. 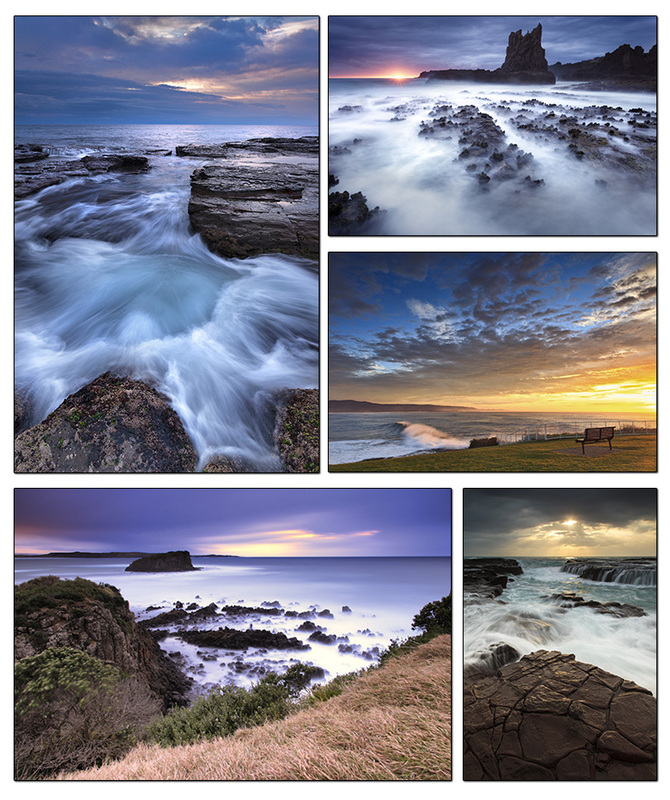 My name is Steve Arnold, I live in Sydney Australia and I love shooting Seascapes! 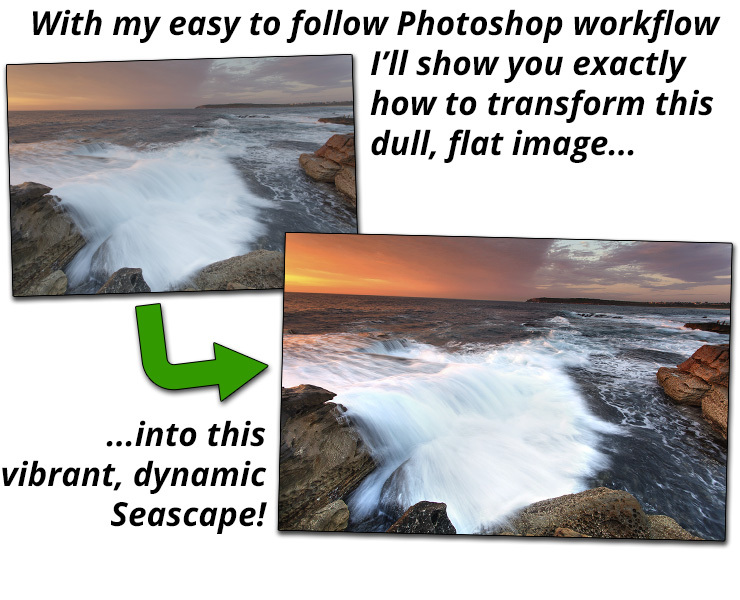 Please stick around whilst I tell you about my step by step formula that can help you create wildly beautiful seascapes of your own no matter if you've tried already but failed to get the results you wanted, or if you've never even shot a seascape before. But the photo's I came home with at the end of the day were no better looking than what I used to take with my old point and shoot camera! Then I'd hop online and start checking out the latest and greatest images on Flickr and instantly become depressed that my shots would never look as good as these guys. I mean, the photographers I was following were producing shots that were out of this world and looking at them made me embarrassed to even show anyone my own. I became so depressed with my own photography that I was about to jack it all in. Now, the picture was still rubbish as I still didn't know what I was doing at the time, but I suddenly had something to go on. The problem I was suffering before this moment was that I didn't have someone to guide me, someone to introduce me to certain techniques and ways of shooting and because of this I didn't know where to even start trying to learn them. It took me accidentally stumbling across this long exposure technique at the same time that I happened to be photographing moving water before I even knew the technique existed. But once I found out about it I was obsessed and my passion for Seascape photography was born. I began reading every resource I could find about long exposure techniques and before long I had gotten my mind around the technical aspects of shooting this way. But my photo's still weren't turning out all that great. But I wasn't giving up! I've spent the past four years mastering my seascape photography skills by a combination of my own trial and error on countless early morning and late evening photo shoots and I've condensed all my years of figuring this stuff out for myself into a step by step formula and discovered the secret of taking amazing seascape photos every time. 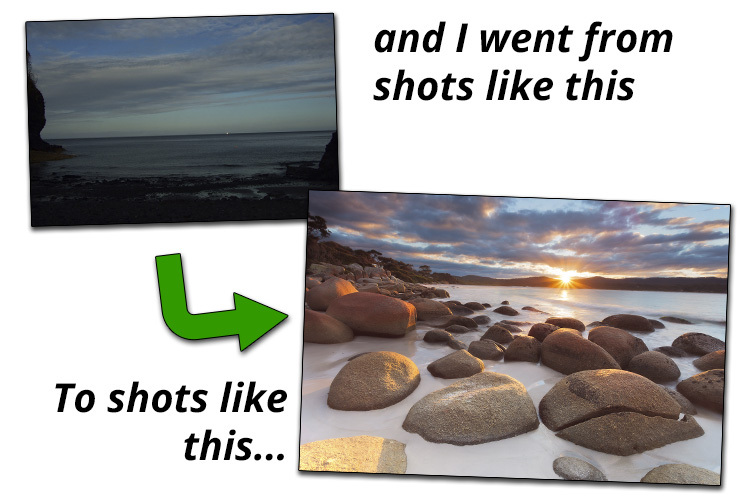 Only once I had discovered and started implementing what I'm about to share with you was I able to produce consistently good Seascape photos that I was truly proud of. The years of learning really were the “long way round” and I wish that I had known at the beginning what I know now! What I'm about to reveal is probably the one thing that's had the single biggest effect on taking my own photography to the next level. The #1 most important thing is your workflow. If you don't have a solid workflow that you can rely on to help you make the right decisions or use the most appropriate techniques for any situation then you will never be certain of making the best image possible time after time with iron-clad consistency. Once you have developed your own precise step by step workflow you'll be able to produce consistently beautiful photos without any guesswork even if you're not a professional photographer or even an expert in Photoshop! I knew the whats and the hows, but I didn't know the whens and the why's until I developed my own set of procedures and decision points and molded them into a solid workflow. That was until I discovered the secret of developing a workflow! With all this said, it's not enough just to know that you need to follow a solid workflow. If you want to hit the ground running then you need to start out with a tried and tested set of instructions and to know exactly how and when to apply them. If you don't have this in place and you start creating your own without having the experience of knowing what works and what doesn't, you could end up tying yourself into a workflow that just doesn't produce good results. Imagine the time you would waste coming up with a new workflow of your own and then sticking to it time after time for consistency, only to find that you still haven't been getting the shots you wanted because your workflow was flawed! The truth is that if you follow what I'm about to teach you to the letter, you will be taking better seascapes than you've ever shot before. At the end of the day, I'm not a professional photographer with years of training or study under my belt. I am just a regular guy who used to be constantly disappointed in my own photography and wishing I could be the friend on Facebook or Flickr always being told how good my photos were and being constantly asked for prints to hang on peoples walls. Now through years of experience and self learning I have come up with a shortcut for photographers wanting to skip straight to taking awesome photos without spending years getting there. It's the worlds only step by step guide to producing amazing photographs of one of the most breathtaking and attention-grabbing styles of photography, without spending years learning it all yourself - and it works even if you've only just bought your first camera and especially if you've never shot a seascape before! If you're the kind of photographer who likes to read, read, read and study every detail of photography meticulously before you even get your camera out, then this is not the system for you. If you don't like to try new things or to learn by taking action, then I want you to close this page right now. 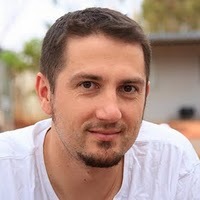 But, if you're someone who is ready to take my proven blueprint and start using it straight away to take better photos that ever before, then this system is for you. I'm here to help you grow as a photographer and I want to do this by giving you a headstart in a style of photography that makes viewers jaws hit the floor when they see your images. I want you to be the one your friends get jealous of when they see your photos and wonder how on earth you took them. So if you're one of these people that likes to struggle for years, learning everything yourself through trial and error, taking mediocre shots along the way, then this is not for you. But if you're tired of wondering how to take photos that make people sit up and say “wow” when they see them, if you're sick of taking shot after shot and wondering why you just can't produce the results you really dream of, and you just want to leapfrog straight to the bit where you are the one taking the photos that everyone else wishes they took, then you're going to want to know what's in the Seascape Photo Mastery Fundamentals eBook. On page 49 you will learn my Water Flow Rule. This one technique will allow you to capture the perfect amount of water movement in your Seascape without wasting precious time with trial and error. On page 42 you will learn the Pre-dawn Exposure Principle. This 8 step procedure lets you dial in the perfect exposure settings in Manual Mode on your camera even in near darkness even if you've never used your camera in Manual before. On page 30 you will find my Ultimate Preparation Checklist that you can refer to every time you go on a shoot so that you'll never leave home unprepared. On page 14 is my Quick Start Long Exposure Primer that teaches you how to take long exposures even if you've never taken your camera out of Auto before. Without this you'll be left out in the cold if long exposures are new to you. On page 52 is my Panic Eliminator Troubleshooting Guide – here you will learn how to quickly recover some of the most common problems you will face without wasting precious moments when the light is “just right” and things are going belly up. On page 58 is my 11 step Failsafe Photoshop Workflow where I lay out an exact step by step blueprint for bringing your photos to life in post without needing to be a Photoshop expert. On page 63 you'll find my Perfect White's Procedure which breaks down three subtly different methods for fine tuning the colours in your seascape for ultimate realism even if you don't remember what the colours looked like “exactly” at the time. This guide literally is the manual that I wish someone had given me when I was starting out shooting Seascapes. I've written it in easy to understand language, with any complicated terms or techniques fully explained in layman’s terms. You could literally pick this guide up having never held a DSLR camera in your hands before and within days you'll be shooting some great seascape photographs. You're probably wondering how much a superb guide like this is actually going to cost you? Well, I'll get to that in a second... But first I want to warn you about the technique I'm going to teach you on page 70!! This one technique is going to make your seascapes virtually pop out of the screen so much that when you share them on facebook your friends may end up sending you the check for new computer monitors because they knocked old ones off the back of the desk trying to dive head first into your photo!! 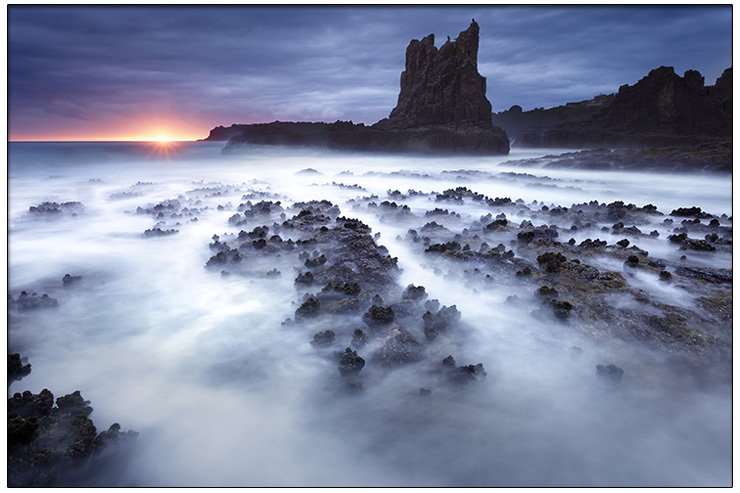 OK, so what is the price of the Seascape Photo Mastery Fundamentals eBook? Or you could spend countless hours trying to piece all this together yourself from numerous websites, forums and other training courses and THEN spend who knows how many weeks, months or even years going the trial and error route... How much is your time really worth? 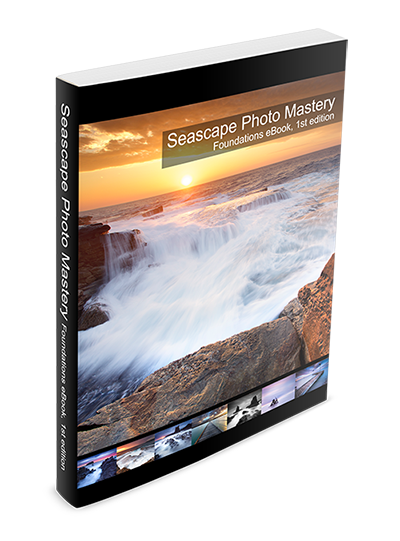 And not only is this a steal at just $27 if after 60 days you are not satisfied with the Seascape Photo Mastery Fundamentals ebook for any reason at all, simply say so for a full, courteous, no questions asked refund. I'm also going to throw in all these great bonuses for you too! I've put together an over the shoulder video in the members area for anyone still getting to grips with learning one of the single most important Photoshop techniques for Seascape Photography. If you've never used layer masks before or they've always sounded too complicated, you won't want to miss this! I'll give you access to the original RAW files that I used to create the entire Post Processing section of the eBook and videos so that you can follow along and master the the Photoshop tehcniques being taught even if you haven't taken your first seascape photo of your own yet. 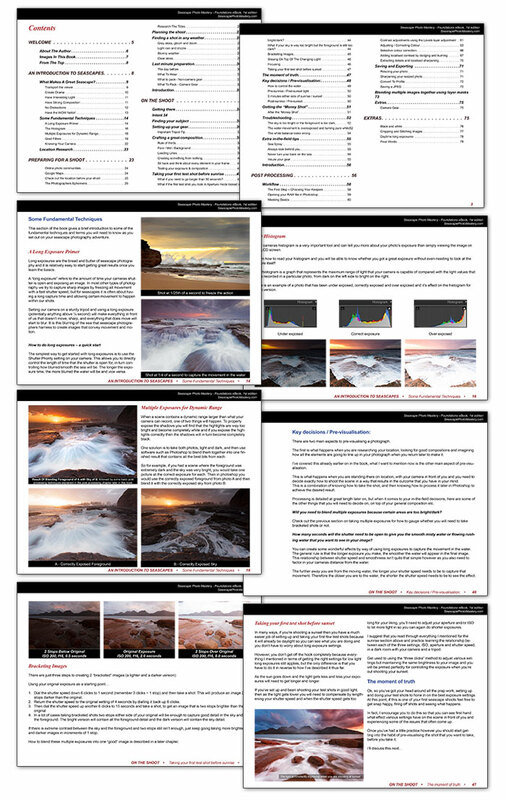 You'll receive all future updates to the Seascape Photo Mastery Fundamentals eBook and bonuses absolutely free. You'll never miss out on any new techniques or methods that I include in the Seascape Photo Mastery Fundamentals system. Complete Photoshop walkthrough bonus videos! A complete video walkthrough of the Photoshop techniques detailed in the ebook showing you how to process the example image from a flat RAW file all the way to the finished image ready for printing or sharing online. Watch over my shoulder as I explain every step of the post processing workflow and do it right in front of your eyes. 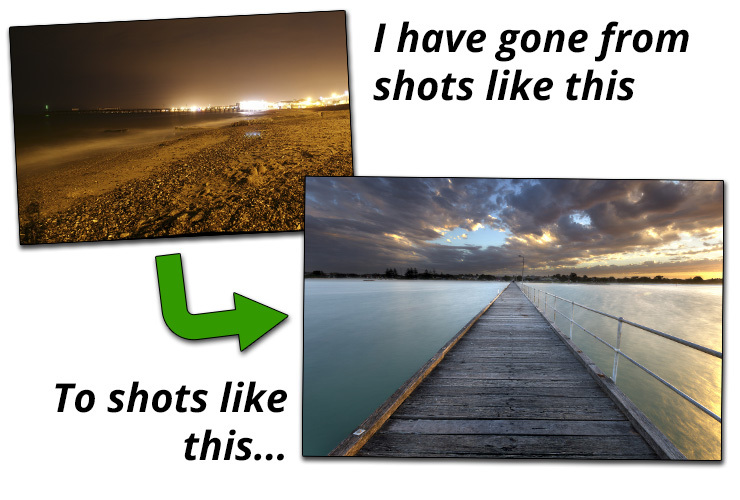 You'll be suprised how easy it can be to make your photo's really shine in Photoshop! SO you get the Seascape Photo Mastery Fundamentals eBook plus all these bonuses, all for just $27 and it's all fully guaranteed for 60 days. After you place your order, you'll receive an email within just a few minutes. This email will contain your password which will give you access to the members area. After you use this password to log into the members area, you'll be able to download the eBook straight to your computer and start reading it right away. Your privacy is 100% protected and your billing is discreet through my Merchant Account provider "eway.com.au". And just to let you know, your purchase will appear on your credit card statement as coming from my company name "Blaze Internet" - Not "Seascape Photo Mastery". ...are you ready to take your photography to the next level? No, everything I’m offering here is available for the low one time payment. Will this work if I'm a beginner photographer? Yes, you will learn everything you need to know from the ground up with step by step instructions on how to choose the best camera settings to knowing how to compose the perfect seascape. Will this work if I'm an experienced photographer? Yes. Seascape photography is a very different art to most other styles of photography so even if you’ve spent years shooting weddings, portraits, landscapes etc you may still struggle shooting seascapes if you go it alone. This guide will help you make the transition and start shooting amazing seascapes on your very first attempt. If you have got any type of DSLR camera then you will be able to follow along with what the eBook teaches. If you have any other type of camera then you need to make sure that it has the functionality to let you fully control the Aperture, Shutter Speed and ISO. Many modern cameras come with this ability so check your manual if you are not sure. Look for the ability to shoot in “aperture priority”, “shutter priority” and “manual” modes. Whenever you are shooting any type of long exposure you will need a tripod to hold the camera still. Any type of tripod will be good enough to get started, but the stronger and steadier the better. If you are serious about taking your photos to the next level then you will need to have access to Photoshop. With Adobe’s new “Creative Cloud” subscription options, you can now get access to Photoshop and Lightroom for a low monthly payment. And they even give a 30 day free trial too, so there’s no reason not to give it a shot! This is a completely digital product which means that you will gain instant access once your payment is complete. No need to wait for anything to turn up in the mail! Once you have clicked on “Add to Cart” and completed your payment you then need to click on a link titled “Click here to access your digital product” which will appear on the payment confirmation page. At this point you will immediately receive an email containing login details for the membership area of this web site. Use these login details to gain access to the membership area and from there you can download the eBook in PDF format to store on your computer and read any time you like. To read the eBook on your computer you will need to download and install the free Adobe Acrobat Reader application. You will also be able to view the bonus videos online from inside the members area. Are you reading this far and still wondering if my Seascape Photo Mastery Fundamentals eBook and bonus videos are right for you? Click the Add to Cart button now. Remember... This is guaranteed for 60 days so if you're still on the fence, you don't even have to decide right away... So just say "maybe..."
You can click the Add to Cart button, get into the members area, download the eBook, watch all the videos, go out and start shooting some seascapes over the next couple of weeks... and then if it's still not for you then email me and I'll send you a quick refund in full. Get yourself into the members area, try it out and then let me know what you think!